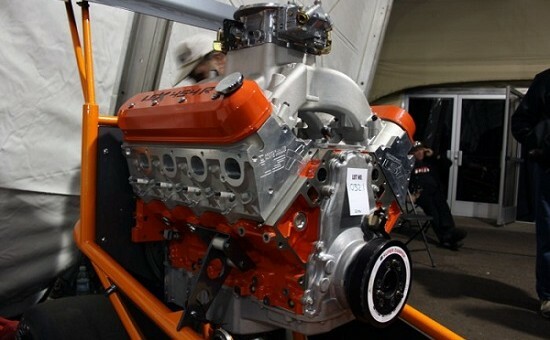 General Motors’ LSX454R engine is the most powerful crate engine Chevrolet Performance has ever produced. LSXTV recently had the chance to document the build process of the racing engine, which is all done by hand, at a special GM facility in the Detroit Metro area. When engineering the LSX454R, Chevrolet was obviously after high peak horsepower and torque numbers, but also wanted the engine to be as durable as possible as it would mostly be used for drag racing purposes. To ensure its durability, engineers subjected it to 600 simulated back-to-back quarter mile passes on the dynamometer. Engineers estimated in the right car, the LSX454R could achieve nine second quarter-mile passes. So for their simulations, they dialed in the parameters of a nine-second car equipped with a two-speed automatic transmission. The simulation would begin by holding the throttle wide open for two seconds, to simulate a burnout. Then, the engine would idle as it approached the figurative light tower before going back to WOT for the pass. Once the pass was over, they would let the engine idle for 30 seconds to simulate driving back to the start of the drag strip before redoing the whole process over again. “We did that for 600 trips down the simulated drag strip, with only a shut down every 50 events to verify valve lash and the health of the engine,” explained Parker. The average drag racer would make 600 quarter-mile passes if they raced six rounds every single week for two years, which is more racing than most people will ever do. The reliability of the engine is remarkable when you consider it has a 13.1:1 compression ratio and is officially rated at a scarcely believable 770 horsepower at 7,000 rpm and 612 lb-ft of torque at 5,600 rpm. What’s more is those figures may still be conservative numbers offered up by Chevrolet Performance. The LSX454R is built with extreme care at a special Chevrolet Performance facility by engine builders who follow the engine from its inception until its completion. LSXTV says every component in the rotating assembly have their specifications recorded in a master file for each individual engine and computer-controlled and calibrated torque wrenches ensure consistently tight bolts. So while the technology behind the LSX454R may have been around for ages, the techniques used to manufacture it are as high tech, if not more, than those to build other engines.